Alaska’s long, and storied relationship with aviation began in 1913 when Fairbanks merchants arranged for James V. and Lilly Martin to bring their airplane from Seattle to Alaska’s Golden City. The Martins shipped their crated airplane from Seattle to Skagway by ocean steamer, and from Skagway to Whitehorse to Fairbanks by steamboat. Martin took off from a ball park the evening of July 3 and flew the plane over Fairbanks at an altitude of 200 feet and speeds of up to 45 miles per hour. In all, the couple made five flights in three days at Fairbanks. Ten years after the Martin flights in Fairbanks, Southcentral Alaska embraced aviation when the entire town turned out to clear Anchorage’s first airstrip on what is today the Delaney Park Strip. These events changed Alaska forever, and mark the beginning of a rich history of aviation, unique to the state of Alaska. A heritage we believe is well-worth saving. Now you can help preserve the history of aviation in Alaska by contributing to the Alaska Aviation Museum Endowment. The Endowment’s sole purpose is to assist the Alaska Aviation Museum in its mission to preserve and present the story of how aviation brought Alaska together – and the pioneer aviators who flew their way into history. Watch a short video on the important role aviation has played in Alaska. Alaskan pilot Noel Wien founded Alaska's first scheduled airline in Fairbanks in July of 1924. That was also the year that Wien made the first non-stop flight from Fairbanks to Anchorage. He later was the first pilot to fly from Fairbanks to Nome, to fly across the Arctic Circle, to fly from Alaska to Siberia and to fly an injured person to a hospital. Also in 1924, Fairbanks high school science teacher and pilot Carl Ben Eielson flew an experimental air mail flight between Fairbanks and McGrath. His several-hour, 271-mile flight one way supplanted a dog-team mail delivery route that took as much as three weeks. That was also the year four army aircraft capable of landing both on water and land made a round-the-world flight. These float planes touched down at Sitka, Seward, Chignik, Port Moller, Dutch Harbor, Atka and Attu on their 175-day, 26,503-mile globe-circling trip that began and ended at Seattle. Read more about the amazing history of aviation in Alaska. 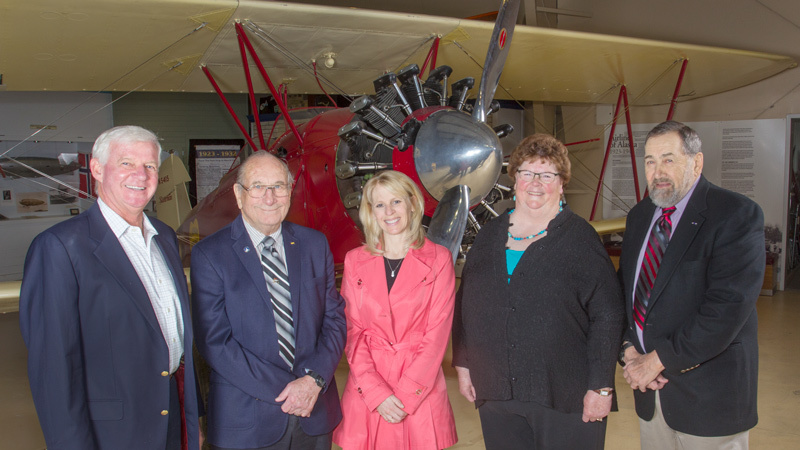 The Alaska Aviation Museum Board of Directors created the Alaska Aviation Museum Endowment (AAME) to provide a sustainable source of revenue for the Museum to maintain and expand its collections and introduce new exhibits. In doing so, we will provide for the growth, stability and continuation of the Museum and the preservation of Alaska’s aviation history in perpetuity. The Endowment received its official Certificate of Incorporation from the State of Alaska on June 12, 2017, and has been granted 501(c)(3) status by the Internal Revenue Service (EIN # is 82-2633799). The Endowment is underwritten by a major, initial donation of $500,000. Copies of our Articles of Incorporation, By-Laws and various Policy documents are available for public review during regular operating hours at the Alaska Aviation Museum. The mission of the Alaska Aviation Museum Endowment is to enhance and ensure the financial security of the Alaska Aviation Museum now and for future generations. Donations to the Museum’s Endowment can be cash or stocks, a donation of property or listing the AAME as a named beneficiary on an insurance policy, among others. Funds will be invested to grow the principal and provide investment income for future investing and expenditures. A donation to our Endowment signifies a lasting legacy by the donor with no cost to the donor after the gift is made and, in the case of planned gifts, costs the donor nothing during his or her lifetime. When you are ready to make a contribution to the Endowment, or if you have any questions, please contact our board of directors to schedule a meeting by calling (907) 771-0515 or emailing info@aamendowment.com.